Hi all! Is it finally starting at act like spring where you are? I think the temperature here in NJ actually got above 60 degrees today! Of course, it’s supposed to be all crappy and rainy today but that’s okay because I just baked a batch of sunshine last night. 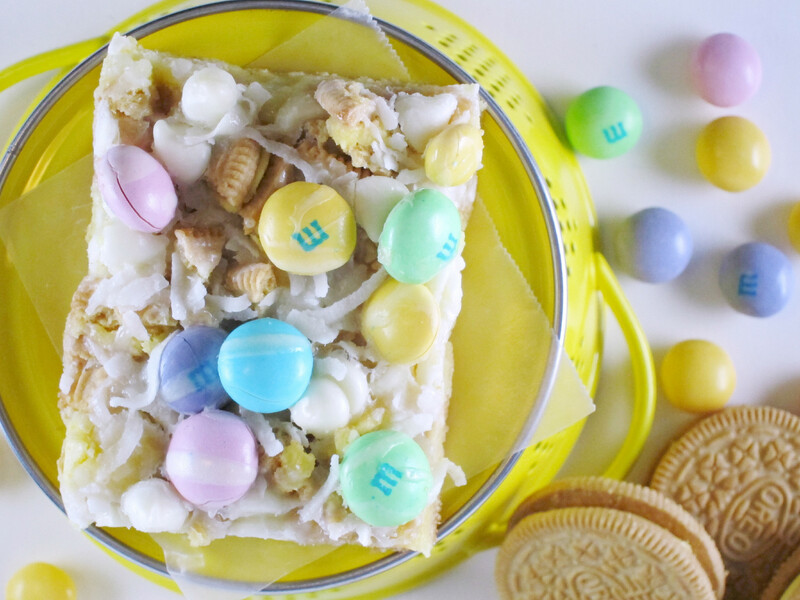 🙂 Lemon cake, coconut flakes, Lemon Creme Oreos, pretty pastel White Chocolate M&M’s. These Lemon Coconut Magic Bars look like spring and taste like summer! 2. In a large bowl combine the cake mix, egg and butter until a soft dough forms. Press the dough evenly in the bottom of the pan. Bake for 10 minutes. 3. While the dough is baking, roughly chop the Oreos into small pieces and measure out the M&M’s, white chocolate chips and coconut flakes. 4. Remove the pan from the oven and pour about 3/4 of the sweetened condensed milk on top of the cake. Next, evenly cover the cake with the chopped Oreos, white chocolate chips, coconut flakes and White Chocolate M&M’s. Drizzle the remaining sweetened condensed milk on top. 5. Return to the oven and bake for approximately 15 minutes. 6. Remove from the oven. Allow the bars to set at room temperature until cool before cutting into bars. I stored mine overnight in a covered container in the refrigerator before taking them in to work the next day, but according to the original recipe these will keep at room temperature in an airtight container for several days. I’ll be honest – this might be the best (non-alcoholic) thing I’ve made to date. The house smelled wonderful while it was baking, the lightness of the lemon and the coconut flavors keep it from being TOO sweet and I just love the colors of the M&M’s. 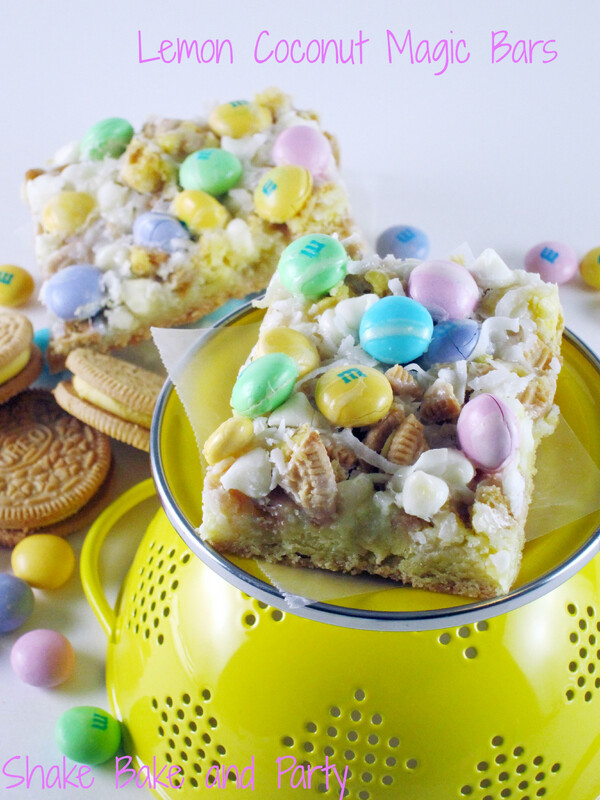 This would be an easy treat to make for Easter, or for the weekend, or for Monday… You really don’t need any reason to make these bars other than the fact that they are absolutely delicious! 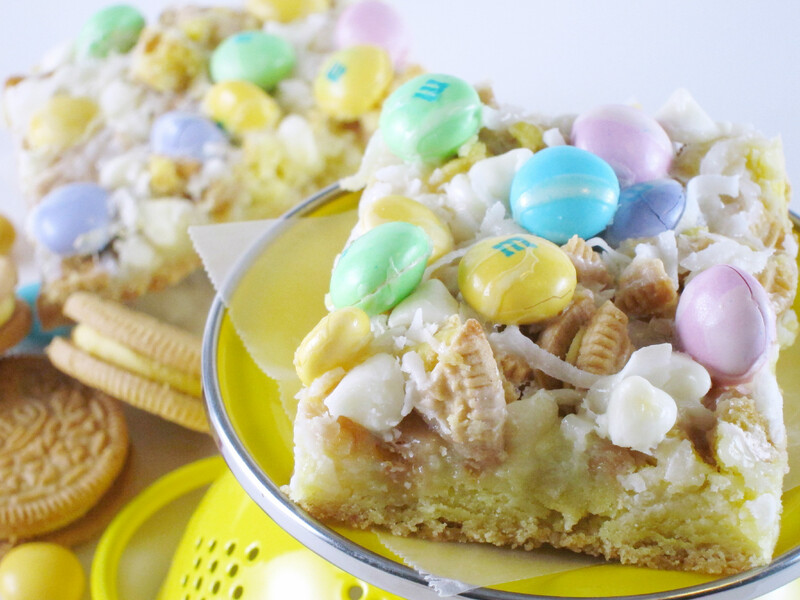 These look great…love the pastel M&Ms…very festive for Easter/spring! Thank you! The colors of the M&M’s are so pretty, aren’t they? I love spring colors! This looks awesome… Its like you shoved everything fab into one bar. I would bake ten more batches if it meant I could put my winter coat away! It got so cold again today! Bleh! Hi Anglea! These are so pretty and love the lemon/coconut combination, two of my favorites! Perfect for spring and Easter! Thanks so much for sharing at Best of the Weekend – pinning! Have a wonderful weekend! Those are so pretty, perfect for Spring. I wish we had those ingredients here I in the UK. Visiting from Marvellous Monday link Party. I co-host Sweet and Savoury Sunday and would love for you to link up with us this week. Have a great week! Pinning, beautiful photo’s too. Thank you so much Laura! You could always sub a plain vanilla cookie for the lemon Oreos and maybe swap out some pastel jelly beans for the white chocolate M&M’s. I’ve been wanting to make a jelly bean bar! 🙂 I will definitely come link up at your party! Have a great day! Oh my goodness, they look amazing! I’m pinning this right now! Many thanks for your kind comment at my blog. 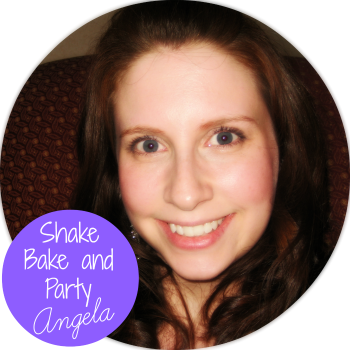 I look forward to following your blog and finding more yummy recipes! These have been featured Angela as one of my favourites on Sweet and Savoury Sunday. Stop by grab a button and link up with us again. Thanks for linking up with us. Have a great weekend!! That’s awesome! Thank you so much Laura! I hope you have a wonderful weekend as well! I gave up sweets. Guess what I’ll be baking this weekend?! I love the flexibility of bars! And I love lemon bars and yours are so fun! Pinning! Thanks for sharing at Saturday Dishes!